Perfect for chicken, shrimp, french fries and more. Great for frying up to six servings. Exterior handle lowers food into oil with the cover closed to prevent spattering. Locking cover prevents spatters and reduces odors. Adjustable thermostat for selecting desired temperature. Indicator light lets you know when oil is ready for frying. Extra large viewing window lets you supervise frying without opening the cover. Nonstick pot removes from base for quick and easy cleaning. Charcoal air filter absorbs frying odors and replaces easily. 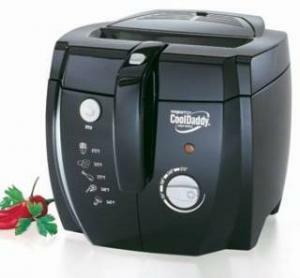 Presto® CoolDaddy® cool-touch deep fryer.